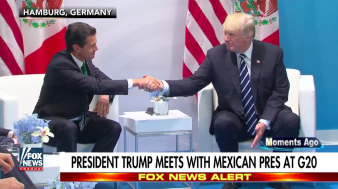 (Breitbart) During a meeting at the G20 in Hamburg, Germany, between U.S. President Donald Trump and Mexican President Enrique Peña Nieto, Trump told reporters that he “absolutely” still wants Mexico to pay for a wall along the U.S. border. Building a wall along the U.S. southern border and getting Mexico to pay for it was a signature promise of Trump’s 2016 presidential campaign. In April, during a trip to the U.S. border with Mexico, Sessions vowed a “new era” when it comes to those crossing the border illegally. He laid out a plan to detain all adults caught crossing the border illegally and adding 125 immigration judges to handle the extensive immigration case backlog.